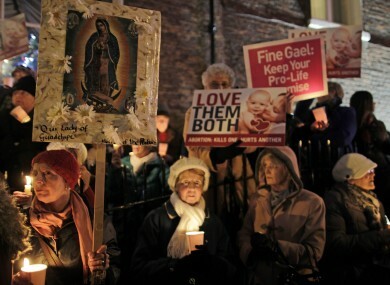 Pro Life protestors outside Leinster House, Dublin, at A Vigil For Life last night. IRISH CATHOLIC BISHOPS have responded to the report of the Expert Group on the Judgement in the A, B and C v Ireland case, indicating their preference for guidelines over legislation. In a statement issued this afternoon, the Irish Catholic Bishop’s Conference said abortion is “gravely immoral in all circumstances, no matter how ‘limited’ access to abortion may be”. The group said that “ethically-sound guidelines may offer a way forward” to provide greater clarity as to when life-saving treatment may be provided to a pregnant mother or her unborn child within the existing legislative framework. They added that when a seriously-ill pregnant woman needs medical treatment which may put the life of her baby at risk, “such treatments are morally permissible provided every effort has been made to save the life of both the mother and her baby”. The bishops criticised the expert group’s report, saying it “takes no account of the risks involved in trying to legislate for so-called limited abortion within the context of the X-case judgement”. The Catholic Church in Ireland’s hierarchy rejected three of the four options put forward by the report as they were seen to involve abortion. “This can never be morally justified,” they said, adding that the European Court of Human Rights does not oblige the Irish Government to legislate for abortion. The group also urged “calm” over the issue. “A matter of this importance deserves sufficient time for a calm, rational and informed debate to take place before any decision about the options offered by the expert group report are taken. All involved, especially public representatives, must consider the profound moral questions that arise in responding to this report. It also highlighted other concerns the Church has about the report. The judgement of the European Court of Human Rights permits options on this matter of fundamental moral, social and constitutional importance that are not offered by this Report. This includes the option of introducing a constitutional prohibition on abortion or another form of constitutional amendment to reverse the ‘X-case’ judgement. They also say the report provided no ethical analysis of the options available, adding that the issue is first and foremost a moral one. Yesterday, Health Minister James Reilly reiterated the government’s commitment to implementing the expert group’s recommendations. “This does not mean abortion on demand,” he insisted. The Report provides no ethical analysis of the options available, even though this is first and foremost a moral issue and consideration of the ethical dimension was included in the Terms of Reference. A matter of this importance deserves sufficient time for a calm, rational and informed debate to take place before any decision about the options offered by the Expert Group Report are taken. All involved, especially public representatives, must consider the profound moral questions that arise in responding to this Report. Abortion is gravely immoral in all circumstances, no matter how ‘limited’ access to abortion may be. Email “Bishops say expert group ignores risks of legislating for limited abortion”. Feedback on “Bishops say expert group ignores risks of legislating for limited abortion”.